@Donald Drumpf, if enough parents do it, it could be considered genocide. @Gamasennin, yeah, apparently this was a thing before they, you know, created a measles vaccine. It’s safer to contract and survive measles as a child, but having measles as a child can increase your chances of disabilities later in life. In an age where information is so readily available people are becoming more ignorant. That’s much worse. Vaccinations aren’t just injecting kids with the virus. It’s an adapted version that triggers the auto immune response without the virus actually being able to ravage the system. This is how you kill or permanently disable your kids. Giving them polio and shït. Holy fk I hope this is a lie. @Rowule, This used to be extremely common practice back before vaccines were widespread. The idea was that if they get exposed to it when they’re young they’ll gain an immunity to it later in life. Basically the same logic as vaccines just, y’know, wrong method. Very wrong method. @TheRatMan, I remember The Simpsons did a thing like this for when Maggie got chicken pox. @that voice you hear, the one where homer gets chiken pox aswell, for he lived in an age before vacination was the norm. @that voice you hear, Chicken pox is a very different story. Chicken pox is annoying for a few days with a very low risk of becoming serious let alone lethal. Measles on the other hand is lethal even with proper medical treatment. @Gamasennin, FYI, the older you are before you get chicken pox, the more serious it is. People in their 40-50s and beyond can quite easily die from contracting chicken pox for the first time. @RomeoStealYoGurl, Vaccine doses are not only minuscule but the disease inside is rendered inert by the other chemicals in the vaccine. Essentially the disease sample is effectively “dead” on arrival in a vaccine, giving the body the chance to recognize the disease and prepare against it in case an actual infection occurs. 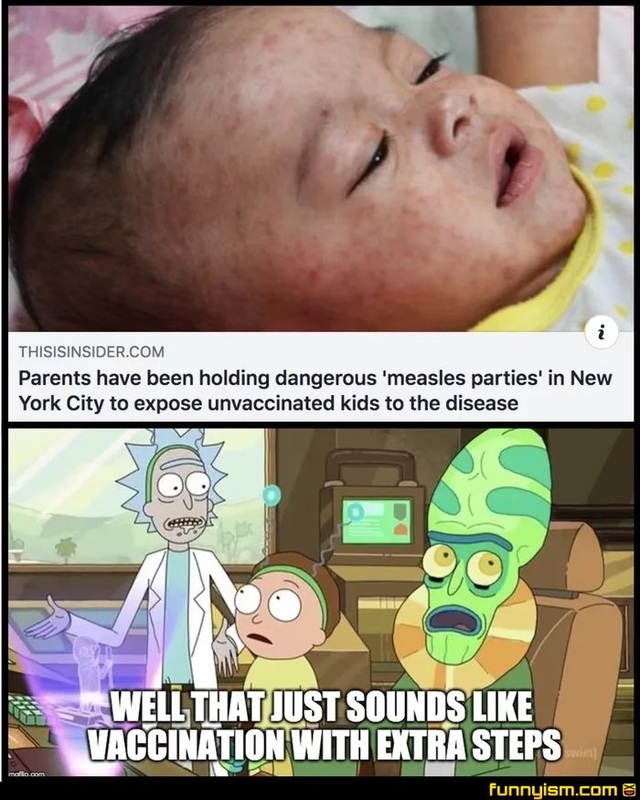 Infecting a child, meanwhile, outright puts them in harms way by making them sick with an active disease. Only it's not because the measles virus can linger in your body and cause serious issues. @Proactive Citizenry , IT IS ALWAYS TIME FOR A CRUSADE! THAT IS WHY WE OF THE BLACK TEMPLARS ARE ON THE ENDLESS CRUSADE TO RID THE GALAXY OF ALL XENOS, HERETICS, AND MUTANTS! WE SHALL NOT REST UNTIL EVERY LAST ONE OF THEM HAS BEEN MARMALIZED! This shjt was smart back when we didn’t have vaccines but now it’s the equivalent of making a fire with sticks because lighters and matches are harmful artificially made devices that cause cancer. Do you want brain damaged kids? Because that what you’ll get if they live through the fever.